If you missed the live broadcast of Science Live: Secret World of Ferns, it’s now on YouTube so you can watch it now or anytime you like. The video explores the surprisingly complicated life-cycle of ferns, how to distinguish the different kinds of tree ferns, and we see inside the room holding Te Papa’s collection of plant specimens. 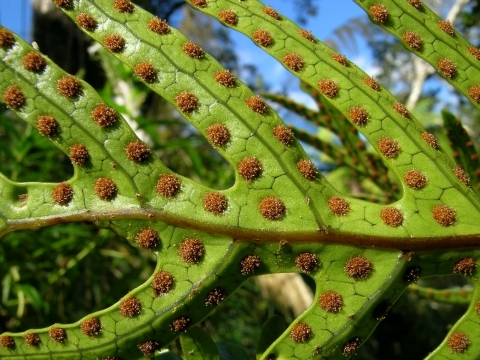 Te Papa is currently running a citizen science competition Find ferns and win!. Entry details are here (closes 31 May 2014). The prize is either a natural history book from Te Papa Press or a personal tour of Te Papa’s botany collection. You can get your eye in for ferns with our quiz: Is it a fern? Hound’s tongue fern, Microsorum pustulatum, has its spore-producing capsules in circular, orange clusters on the underside of its fronds. Photo (c) Leon Perrie. YouTube video showing the catapulting of spores out of their capsule. Blog post about the fern life cycle and gametophytes. 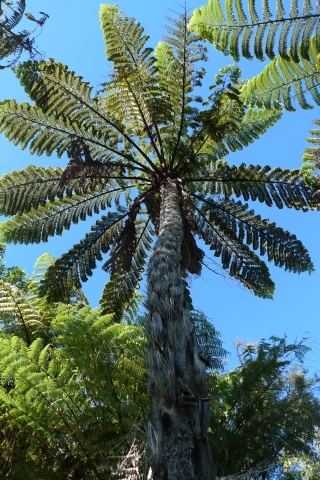 Online guide to the different tree ferns in New Zealand. Video about the plant specimens collected in New Zealand during Captain Cook’s first expedition to the south-west Pacific in 1769-1770: the Banks and Solander Collection. Blog post about tangle ferns, particularly Gleichenia inclusisora. An example of one of the completed eFlora pages: hound’s tongue fern, Microsorum pustulatum. And, finally, if you’d like to try connecting with ferns in a different way, try our personality test: What fern are you?